Everything we do is an investment in community. We believe that if all our assets are invested in building healthy communities, where cooperative principles and practices are flourishing and social justice and environmental sustainability are enhanced, the world will be a better place and our community well-being will be enhanced. Building on our track record of supporting community in a progressive and engaged way, we have the added advantage of being connected to Canada's largest community-based credit union. With the business acumen of the credit union and deep connections in the progressive charitable sector, we define success as building and strengthening our relationships in our community to help build a future of shared success. Whether you are seeking support from us for your impact business or real estate project or you would like to make a difference through a donation or bequest; we would love to connect with you so that we can build a more vibrant future together. 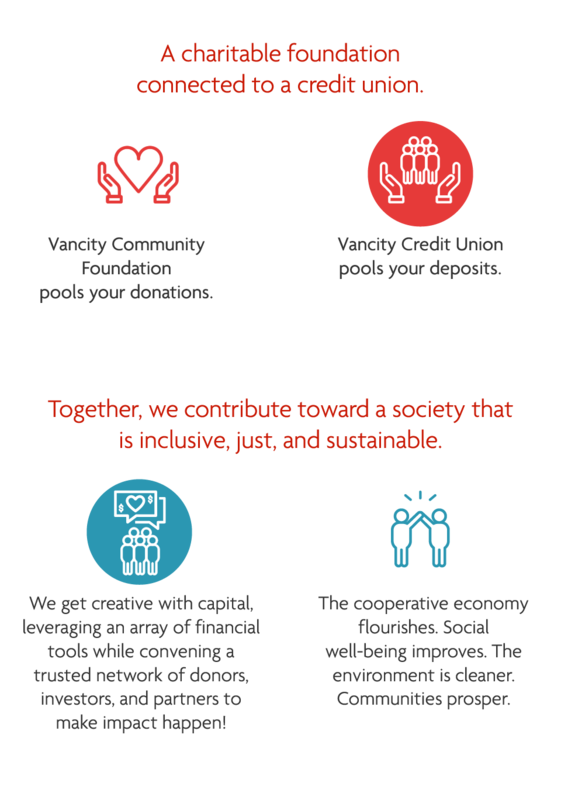 In 2017, more than 1500 members of our community donated through Vancity Community Foundation, bringing us to over 200 Donor Advised Funds. Together we distributed more than 1,100 grants to community. We provided a total of $406,000 of direct support to social enterprises meeting community needs and addressing poverty by increasing jobs or access to goods and services in under served communities. We invested in 15 social purpose real estate initiatives that promise to house individuals and organizations, increase and/or retain community ownership and assets, and build opportunities for shared spaces. We held 30.4% assets as direct impact investments.